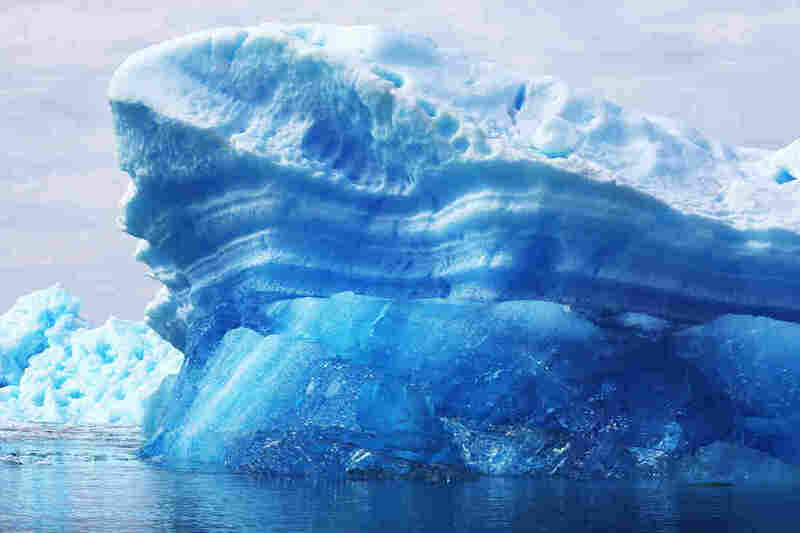 Arctic Is Warming Twice As Fast As World Average Polar bears continue to take a hit in regions with the greatest loss of snow and ice, the latest report card on the Arctic shows. Meanwhile, plankton are thriving as the sea heats up. A lone polar bear poses on a block of arctic sea ice in Russia's Franz Josef Land. Jackie Richter-Menge, a polar scientist with the U.S. Army Corps of Engineers who collaborated with NOAA on the analysis, says the findings demonstrate the "power of persistence" in the Arctic — "persistence in the warming air temperatures and the impact that is having on this icy environment." That's largely because of arctic amplification. Here's how it works: Normally, snow and ice cool the surface by reflecting a lot of the sun's energy back up into the atmosphere. But warming air temperatures melt snow and ice. "And when they melt," says Richter-Menge, "they expose darker regions." Darker regions, once covered in snow and ice, now absorb more heat, like a dark shirt does on a hot, sunny day. The same thing happens when sea ice melts — the exposed water is darker and warms up. Calved icebergs from the nearby Twin Glaciers float off the coast of Qaqortoq, Greenland in 2013. So what happens as a result of this amplification? Well, warmer water affects what lives in it. Apparently, plankton like the warmer conditions; they're thriving. Scientists say they don't know whether that's good or bad for the rest of us. 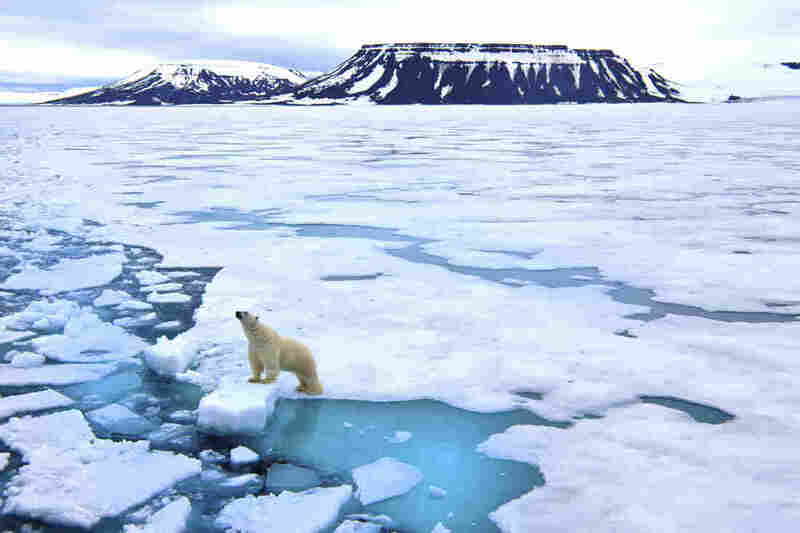 But unlike plankton, polar bears don't like the warmer water and having less sea ice around. "There's a strong connection between what's going on with the sea and polar bears," says Richter-Menge. In regions where the sea ice is holding steady, bears are doing OK, according to the report card. Where the ice is gone, bear numbers are down. Then there's Greenland. The giant land mass is covered in ice that's a mile thick. Geophysicist Beata Csatho at the University at Buffalo has just completed the most comprehensive satellite survey of that ice cover. "There are some places," she says, "where in the last 20 years the ice surface is just lowering, lowering, lowering very uniformly." Csatho, whose research appears separately in the Proceedings of the National Academy of Sciences this week, says she has noticed something else about Greenland's blanket of ice: Because the ice melts from the top down, the surface elevation gets lower over time. And at lower elevations, the air generally is warmer. "As Greenland is losing ice, it gets more and more irreversible," Csatho explains, "because you get the ice into lower and lower elevations." The research shows some exceptions to the warming trend — places where ice is building back up or temperatures are cooling. But overall, warming is winning in the Arctic.